The characteristic Bentley aesthetics have been translated into luxury fittings. 19.02.2014 - Bentley Motors presented its brand new range of home and executive furniture at the recent Maison & Objet fair in Paris, offering the perfect touch of style for classic car fans’ homes. 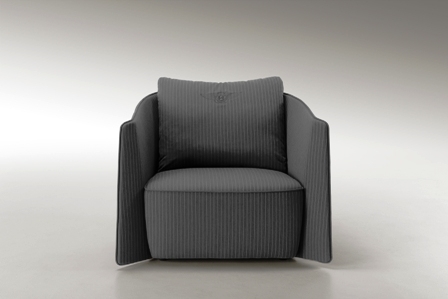 The collection of furniture such as sofas, beds, chairs and sideboards was inspired by the renowned craftsmanship and exquisite materials that characterise the interiors of all Bentley models, and designed and manufactured in collaboration with the Luxury Living Group, one of Europe’s leading furniture makers. Natural colours such as mocha, cognac, taupe, quartz, grey and ice, flank variations of purple-red, burgundy, brick red or blue. Hints of male attire, pinstripe or houndstooth, are introduced into sophisticated velvets and the lightest of cashmeres, crafted with three-dimensional patterns. Smooth leather, fine wools, slinky silk, and woods such as walnut briar root, are combined in a project that captures the essence of the Bentley brand, bringing elegance and tradition into every abode. For motoring magnificence enthusiasts, there could be nothing better. Produced with news.CMS in 0,0623 seconds.